Founded in 1943, Turnstone is a Fort Wayne establishment, a free-standing not-for-profit that provides a comprehensive array of supportive services for people with physical disabilities and their families. Over the past seventy-three years Turnstone has expanded and broadened its services to include an early learning center, health, fitness and wellness programs, the social work services, occupational, physical and speech therapy , adaptive sports and recreation , and adult day services which includes a new memory care program. Just recently, Turnstone expanded its facility by 125,000 square feet with a successful $14 million dollar capital campaign. Organizational longevity and efficiency are key factors in Turnstone’s success, allowing for its reputation in the community. Turnstone is trusted and admired as an important part of the Fort Wayne community, where generations of community members have been served in a variety of ways. Highly organized and systematized, Turnstone has an organization-wide strategy that tracks and forecasts outcomes allowing for success and excellence. 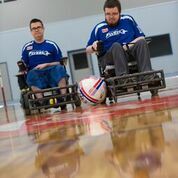 The goals outlined in the Strategic Plan are ambitious, and the 2014-2017 Plan includes “Gain affiliation as a United States Paralympic training facility,” “Achieve recognition as a national leader of programs and services for people with disabilities,” and “develop a board of directors that can provide exemplary leadership and drive revenue,” among others. These goals reveal Turnstone’s dedication to excellence and to being better organizationally and even more comprehensive programmatically. The current Strategic Plan is for a three-year period, and was crafted by clients, staff, and board members. The board & staff are currently reviewing the plan mid-stream to assess what is working, how priorities have changed, and how Turnstone can be best responsive to the needs of clients and their families. Since these factors are constantly evolving, an Organizational Work Plan is created annually to address specific activities included in the Strategic Plan. The focus is on measureable outcomes; monthly & quarterly activities reports help keep tabs on outcomes effectiveness and financials. The eighty-three paid staff at Turnstone, including maintenance, teachers, therapists, administration & program assistants, development team, and health and sports staff are assessed through an annual performance plan and client satisfaction surveys. So too, the board of directors annually review key functions and a personal self-assessment to ensure their commitment to the growth and operation of Turnstone. In the 2014-2015 fiscal year, Turnstone provided 10,849 hours of aquatic, occupational, physical and speech therapy to children and adults, 9,834 hours of adaptive sports and recreation programming, 21,151 hours of all-day, year round early childhood educational programming at the Kimbrough Early Learning Center for children ages 3-6, 16,010 hours of health and wellness provided land & aquatic strength training and exercise opportunity, 4,181 hours of case management for 1,112 individuals and their families, and loaned 412 pieces of equipment to individuals. 21,575 hours of Adults Day Services provided activities and social programs for 90 clients. These hours contributed to their clients’ greater independence socially and physically, providing opportunities for rehabilitation, socialization, physical fitness, and respite for clients’ families. 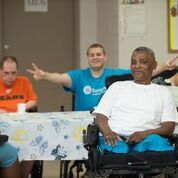 What makes Turnstone unique amongst nonprofits of its kind is the sheer comprehensiveness of their programs that provide services from early childhood through old age that extends far beyond just physical rehabilitation, all in one place. 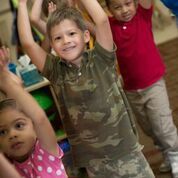 In addition, the Kimbrough Early Learning Center (KELC) is a creative program in that it includes children with and without disabilities. For children with disabilities, this exposure to children who are typically developing will prepare them for school as they get older. 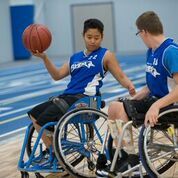 For typically developing children, making friends with and learning beside students with disabilities increases sensitivity and open-mindedness. Adult Day Service clients have many opportunities to give back through volunteering with the KELC program. Turnstone’s nonprofit status and the community’s generous support allows it to provide services to those who are financially unable to receive the same care at hospitals or medical centers; in fact 95% of Turnstone’s clients receive some type of financial assistance or waiver of fees. Mike Mushett, the Executive Director, stated that he has “not seen another facility like it in the United States…and we’ve been able to accomplish that because of the history and the good faith that we receive from the good citizens of Fort Wayne.” Turnstone’s community has been central to its success, as most of the capital campaign for its new facility was enabled by the 250,000 people of Fort Wayne, as well as a number of local foundations—“financial goodwill,” as Mushett describes it. For this reason, replicating Turnstone’s model is difficult due to its unique history with the community and the size and scope of its programming. Over 65% of Turnstone’s budget comes from local & regional support, raised through foundations, individual giving, corporate sponsorship, and special events like the gala and casino night. Additionally, Turnstone utilizes 850 volunteers annually, including clients and their families.